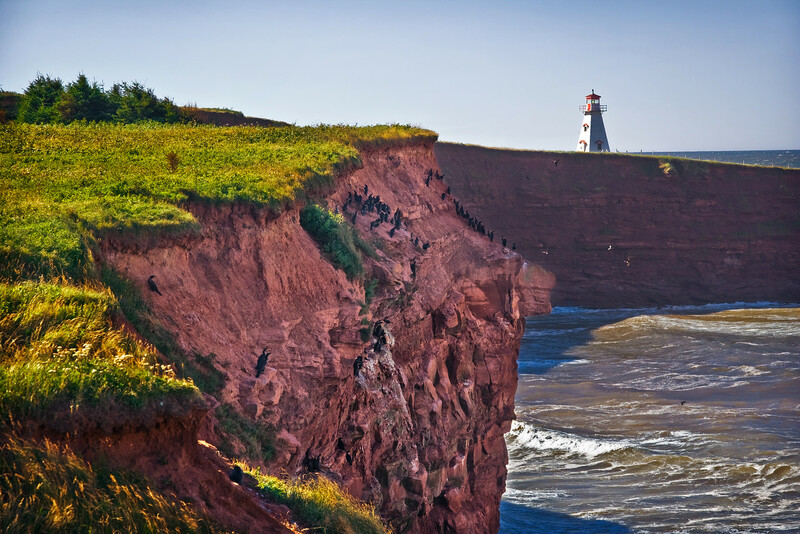 Prince Edward Island. Cape Tryon. 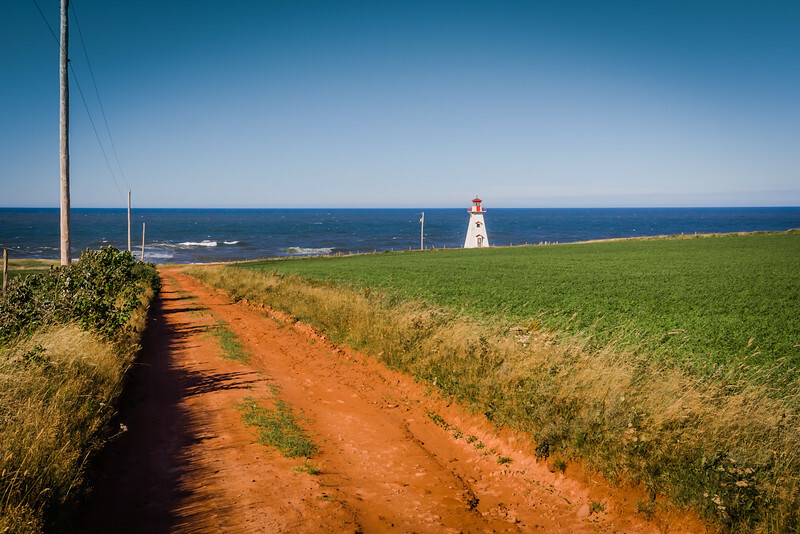 When I first visited Prince Edward Island, I didn’t know about the existence of Cape Tryon either since it isn’t on any tourist maps or in any guides. I discovered it when I was standing in line at the gas station in Charlottetown. 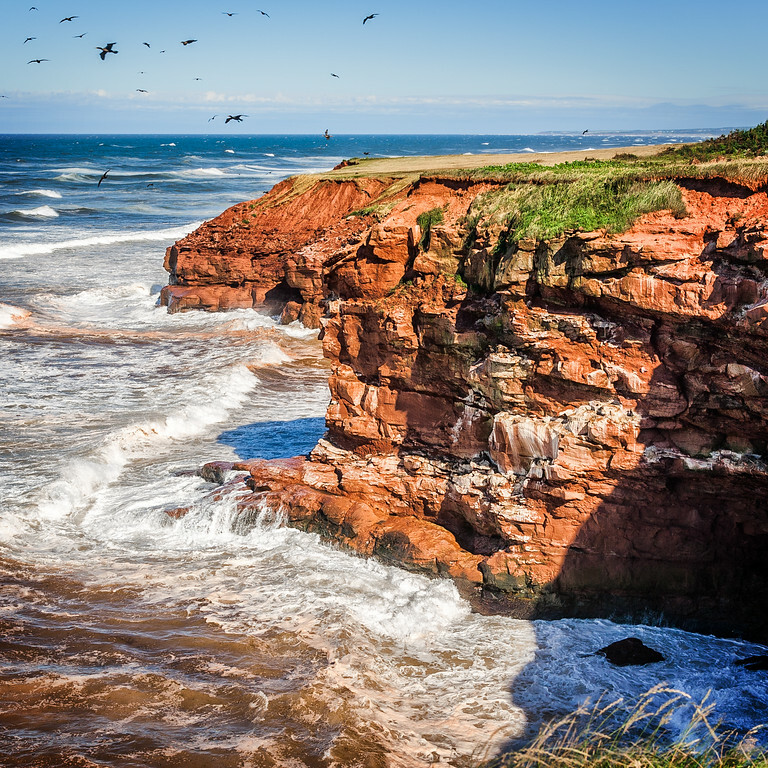 I saw a postcard with an amazing aerial view of the PEI coastline with the caption “Cape Tryon”. Right away I knew I had to find it and photograph it. I bought the postcard, and with the help of Google Maps I managed to find it the next day. Getting to Cape Tryon is mini-adventure of its own. You have to cross a field on a narrow, unpaved one-lane road — and if you drive there after a rain, you risk getting stuck. Since there’s no cell coverage, you’re really on your own when you venture to this location. It reminds me of riding over deeply tracked unpaved roads in Russia when I was a child. At the end of your journey, however, you get rewarded with a beautiful flat spot at the top of a cliff where there is enough room to park a car. 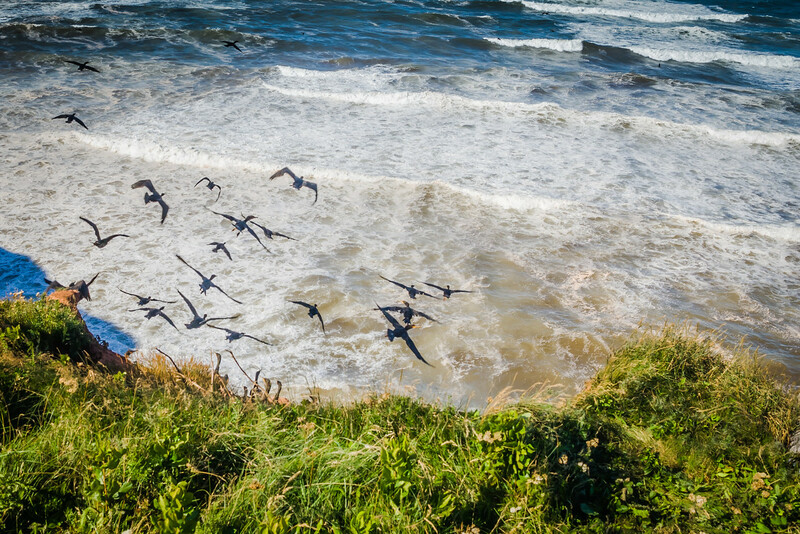 From there, you can take your camera and tripod and walk through fields and along the coastline for miles. After a visit or two, it quickly became one of my favorite places on PEI. 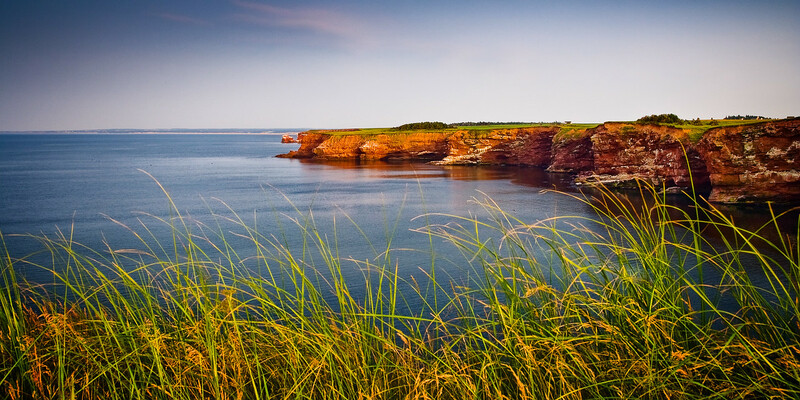 It’s not only a great place for landscape photography but it’s also a good place for a quiet lobster picnic. To get to Cape Tryon, turn off Route 20 at French River, drive though the harbor and turn left at Cape Road. Then after 900 meters, take the second right at Cape Tryon Rd. The funny part of this article besides the amazing pictures you take is that the cliff is very similar to the portuguese one called Roca Cape. Roca Cape is the most western point of Europe, has 140 meters high above sea level (more or less 420 feets). Great pictures Viktor. Luís, Portugal is definitely on my to-do list. 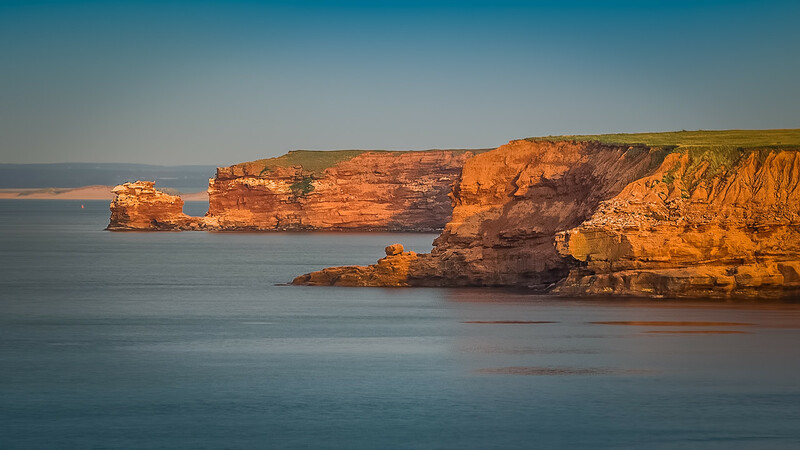 Thanks for letting me know about Roca Cape, just added it to my Evernote travel folder. What time of day do you go to photograph it? Beautiful shots! I am always curious about the time that photos are shot. There is always a certain aesthetic you get from shooting at a specific time. Personally, I love to shoot right before dusk, Pacific Time. Going to PEI this summer (2017) with our friends ( The Tryon’s). Staying in French River. 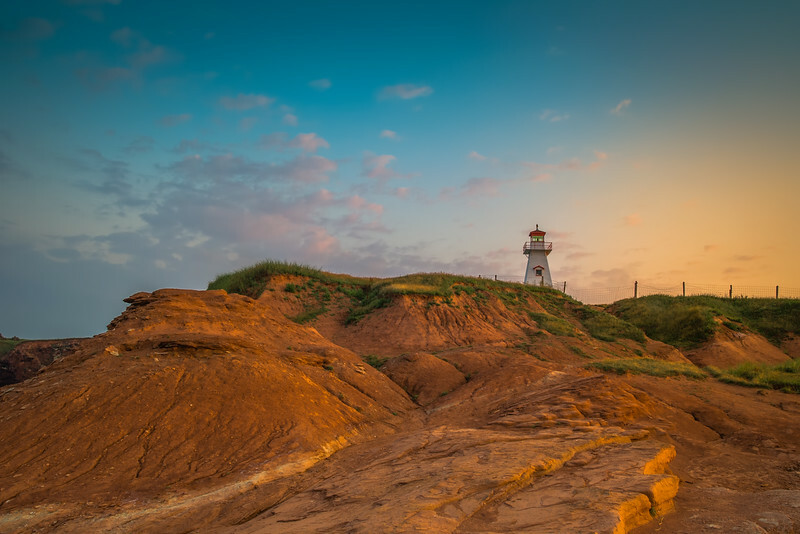 I found Cape Tryon using Google and then found your link looking for photography locations. Thanks for the taking the time to post this information. I’m not sure if my Corvette can make it down that road, but I’m not afraid of dirt. I think the B&B has bicycles we can use.